Logic Firm is a balanced and proven intestinal support for cats and dogs. 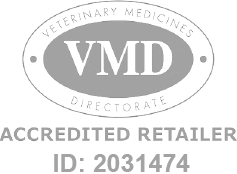 Logic Firm - 10ml is a Prescription Only Veterinary Medicine and by law requires a prescription from your vet. A number of supplements are available, such as Logic Firm, that help to support intestinal function. These contain intestinal cells, and absorbing toxins. There are also newer products available which prebiotics (such as Logic Firm). These help to maintain intestinal flora by promoting the growth of good bacteria at the expense of potentially harmful pathogenic bacteria.